The Midland Weather Alert Radio can be used by itself for those needing to be contacted by a loud siren only. The weather radio has a special receiver that tunes to NOAA's 24/7 National Weather Service broadcast. This system is packaged with a Silent Call strobe that flashes when activated. 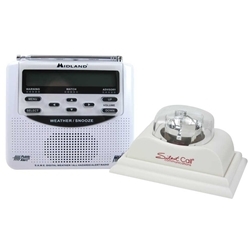 A Midland weather radio with Silent Call strobe that provides audible and strobe alerting of severe weather conditions, giving you around-the-clock, up-to-the-minute weather information.